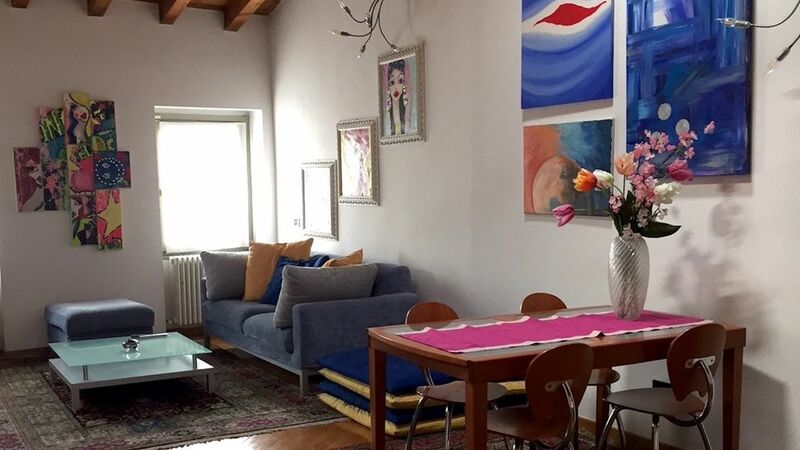 Apartment located in the heart of Bergamo Bassa, steps from Piazza Pontida. In a quiet, restricted to traffic, close to shops, restaurants and pedestrian area. Cozy, spacious and bright, on the fourth floor with elevator, in a strategic position that allows you to easily reach on foot the main attractions of the city. . The apartment is lovely and the location perfect for the city center. It was fully stocked with anything you could need. The location is right in the centre of the city where you can catch a bus or walk to the high town. The bedrooms where lovely size. Wi fi worked perfectly. We coulnt get the TV to work but we didn't need it. The owner was contactable so would have sorted it out if we had asked. poubelle non vidée et vaisselle salle dans le lave vaisselle. Die Betten sind grausam, die Wohnung ist super gelegen, die Kommunikation mit der hübschen Besitzerin ist super. Ruim appartement, dicht bij de hogergelegen historische stad. Aanrader! Met dank aan de eigenaar, die vlot bereikbaar is. Comfortabele woning, en goede uitvalbasis om deze prachtige streek te verkennen.